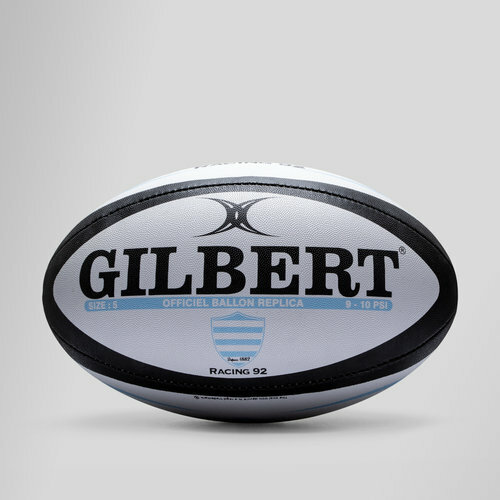 Officially licensed and fully endorsed by Racing 92 rugby, Gilbert are the industry leaders when it comes to producing high performance and quality rugby balls. Made by Gilbert, from 100% durable synthetic material and latex bladder, the Racing 92 Replica Rugby Ball incorporates Gilbert's patented Truflight technology. The result is longer flight and greater accuracy whether passing over short or long distance. In true Racing 92 fashion, a black and sky blue tone runs around the ball accentuating the white referring back to the teams nickname, the sky blues and whites. The signature Gilbert branding come skin black with the distinct club badge over each of the four sides. Ideal for training, matches, or simply recreational use, show your pride and support.